Who is Carter Page and why does he matter? In 2016, the Trump campaign operation named Carter Page as a policy advisor. 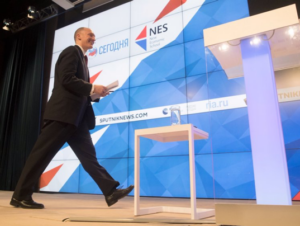 Prior to that Carter Page had no connection to Donald Trump other than to have voluntarily sent policies papers to his campaign – although who his initial contact within the campaign was remains a mystery. The FBI, on the other hand, certainly knew Carter Page was. The FBI began creating a file on Carter Page as far back as 2013. Not long after, Page became an informant in a case against three Russian spies that was prosecuted in a Manhattan federal court. In a criminal complaint filed in 2015in federal court in Manhattan, the F.B.I. and prosecutors accused three Russians of working in the United States as spies. The court documents showed that those Russians tried to recruit Carter Page for unlawful purposes. Prior to that and after working as an investment banker at Merrill Lynch in London, Page moved to Merrill Lynch’s Russia branch, where he was a vice president from 2004 to 2007. That was not Page’s first interest in Russia. “Page’s interest in Russia dates to his youthin New York’s Hudson Valley. Watching a TV news program on arms control talks, he says he noticed that the adviser sitting behind President Ronald Reagan wore a Navy uniform. A few years later, Page enrolled in the U.S. Naval Academy. He later worked in arms control at the Pentagon and completed a fellowshipat the Council on Foreign Relations in New York. Over his career, he’s earned three graduate degrees, including a Ph.D from SOAS University of London. Returning to the FBI, Carter Page’s activities put him on their radar. It is the FBI office in Seattle that runs undercover operations on Russians and Chinese including with respect to industrial and economic espionage and recruiting. Larger counterintelligence operations are supervised and directed out of the FBI headquarters in WDC and NY. History on these operations go back to at least 1987. Interesting cases arefound herethat include threats/recruitments and espionage for perspective. All of that brings us to the FISA application released as a result of the FOIA lawsuit brought by Judicial Watch. Keep in mind that a warrant is not proof of any guilt but rather possible evidence. It is indicative of the government is asking for permission to use additional tools to surveil. With respect to Page, on paper, a “cogent” argument for the first FISA warrant on Carter Page was made to an unknowing Court, i.e. a Court unfamiliar with Carter Page, unfamiliar with the FBI’s prior use of Page as an informant, a Court only getting one side of the argument on facts that were unverified. That “cogent” argument, however, did not exist for the subsequent FISA applications. Why? 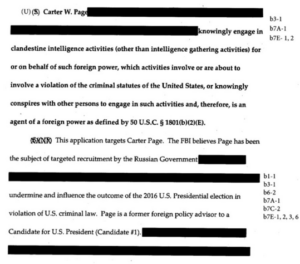 Because the government alleged in each FISA application that Carter Page was an agent of the Russian Federation – an allegation made in the unverified Steele dossier (although given how much the FBI knew of Page and that they used him as an informant, they likely if not definitely knew better). There is also the fact that that allegation has never been proven even though Carter Page continued to interact and even travel to Russia during the campaign season. More than a year after the first FISA application, in November 2017, Page testified before the House Intelligence Committee. He confirmed meeting Russian government officials on a trip to Moscow during the US presidential campaign – but prior to the date of the first FISA application.It is important to note Page also had left the campaign prior to the first FISA application. During his Congressional testimony, Carter Page admitted meeting with Russian officials, some perhaps known as operatives, but he could not remember all discussions or the depth of those various discussions. On to the renewals of the FISA’s. Looking at the text, defining the sources and examinations of the footnotes, each one was the same text as the previous FISA application. Nothing changed including the constant alleging that Page was a foreign agent. 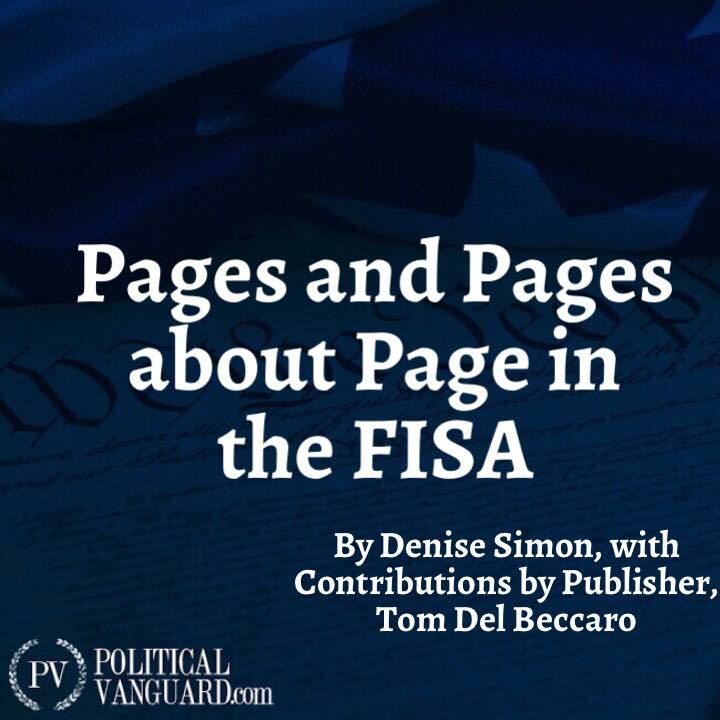 In other words, the FBI made repeated allegations about Page they had to know were not true – but that didn’t deter them from using them in subsequent FISA applications. Also notable in the FISA applications are the multiple mentions of The White House top national security advisor, a.k.a. Susan Rice, having a hand in this process via an Executive Order, the number of which is redacted. That provides evidence the Obama White House knew full well of the people involved, the context, the circumstances and the timeline. For sure it was all launched as a political/legal weapon and those leading the mission for sure include former FBI Director James Comey; former Senate Majority Leader, Harry Reid, former national security advisor and director of the CIA, John Brennan and well you know the rest….those other top operatives at the FBI and the Justice Department. They all exploited a case file, which looked suspicious to the unknown eye. As for now, more pages are still being written about Page…this time by media and pundits. No one, however, can prove Page did anything wrong. But there he was at the start of it all.